Dutch nominees International Mobile Game Awards! This year, the 15th International Mbile Gaming Awards will take place in San Francisco. This year, three games made by Dutch developers have been nominated for the Public Choice Award. 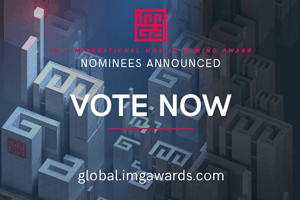 Created in 2004 and with an average of 800 studios participating from all over the world the IMGA are the mobile gaming industry’s leading independent showcase for groundbreaking innovations, displaying exceptional quality and new trends in mobile entertainment. Winners will be announced on March 19, 2019 during the IMGA ceremony, which will take place in San Francisco, USA. Please visit imgawards.com for more information on the contest and the awards.